To build a stronger relationship of mutual support with society, Marubeni believes it must responsibly make contributions according to the needs of the community in the field of social contribution. Furthermore, to heighten awareness of social contribution through volunteer activities, Marubeni has set up a Volunteer Promotion Team which plans and manages employee volunteer activities in cooperation with NGOs and NPOs. Marubeni also encourages employees to participate in volunteer activities by introducing the Volunteer Leave System with five days of leave per year. Based on the company creed “Fairness, Innovation and Harmony,” we will be aware of the responsibility as a corporate citizen in the global community, and take initiatives in social contribution activities. With a universal perspective, we will focus on social welfare, international exchange, community contribution, global environment, and cultural support as the five priority areas. We will actively promote social contribution activities as a corporation, while also encouraging our executives and employees to participate in volunteer activities. Based on the Basic Principle and the Basic Policy for Activities, we have established the following specific policies, and the whole Marubeni Group will engage in social contribution activities. We will engage in a broad range of activities including disaster relief, primarily through support of the social welfare corporation Marubeni Foundation. We will contribute to activities for the international community including personnel exchanges, focusing on support through overseas scholarships and donations. We will engage in activities such as promotion and clean-up in our local communities, focusing on volunteer activities by our executives and employees. In addition to being conscious of the environmental impact of our business activities, we will take the initiative to support comprehensive environmental preservation activities. In addition to cultural contributions through the Marubeni Collection, we will offer extensive support to various cultural activities. We promote awareness and support volunteer activities by our employees, while also providing and expanding the system necessary for the activities, such as the Volunteer Leave System. The Marubeni Foundation was established in 1974 as a private foundation by a donation from Marubeni. The following year, it granted a total of 100 million yen to welfare facilities and organizations across Japan, and has since continued to distribute the same amount each year. The accumulated grants up till 2018 total 4.4 billion yen supporting 2,547 projects. In 2018, the foundation received 526 grant applications from social welfare facilities and organizations, and 63 projects were chosen for funding. For this fiscal year, projects for purchasing vocational aid devices, equipment, and vehicles, as well as facility renovations were mostly selected, so that continuous employment support facilities for the disabled can increase the user’s wages. Pioneering efforts such as a project that adopts robotic suits for nursing care, and a smartphone app development project for dispatching sign language interpreters are also included. Funding for the grants includes investment income from the funds donated by Marubeni, and contributions from the 100 Yen Club, in which current and former executives and employees donate in 100-yen increments each month, and a matching contribution is made by Marubeni. The Marubeni Foundation has made social contributions for over 40 years since its establishment in 1974. Many Marubeni Group employees have participated in its activities, including the “100 Yen Club” that began in 1995, in which current and former executives and employees make monthly donations in 100-yen increments. From FY2015, employee volunteers are also invited to attend the foundation grant ceremonies, which were previously conducted with only foundation personnel and local executives present. As a result, the third year over 100 employees joined in the FY2017 ceremony. Those who attended said “By actually seeing how the grants are utilized, I became more aware of the activity’s significance.” To match the present situation of varying needs of the recipients, a system for sending Marubeni personnel to the recipient to provide human support began in FY2017. With the cooperation of the Human Resources Department, interviews are conducted on both the recipient and the employee to grasp their needs. As of the end of FY2017, 10 employees have begun administrative or on-site supportive activities for eight recipients. We will continue to expand Marubeni Foundation’s activities together with Marubeni Group employees. For youth education and development in emerging countries, Marubeni has set up scholarship programs in eight countries, mainly in the ASEAN region and Brazil. Marubeni’s scholarship fund began in the Philippines in 1989. By tailoring the activities to each country’s educational situation, we give support each year in response to the local request, such as scholarships for elementary to university students, and materials including PCs and stationery supplies. Marubeni provides monetary support to areas struck by large-scale disasters. Marubeni accepts overseas students under its internship program. During FY2017, a total of 24 students from abroad, including youths from Changchun City Youth Federation of China, All-China Youth Federation, National Mineral Resources University of Russia, Sabanci University of Turkey, and École Nationale d'Administration (ENA) of France were accepted as interns at the company. For a period of three months beginning in July 2016, Marubeni accepted a loaned employee from the private organization Ashinaga. 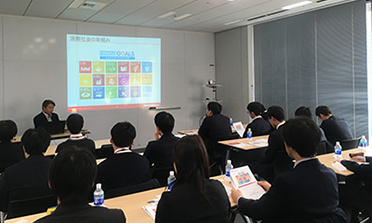 Collaboration with the private sector is an approach mentioned in the SDGs, and it was the first such action for Marubeni. Ashinaga is an organization that provides educational loans and grants to children who have lost their parents in Japan or abroad, and it has supported a total of 90,000 children in 40 years. Yuka Yamada, who was dispatched to Marubeni, had been the head of a related NGO, Ashinaga Uganda for five years from 2012. Making use of her experience, she worked in Marubeni’s Regional Coordination & Administration Department’s Middle East & Africa Team for three months, collecting and transmitting information on the related regions, and planning CSR projects. During her loan period, she also participated in trainings at each Business Group, and deepened her understanding on corporate activities and the African market. After opening the Doha Branch in 1980, and investing in the LNG project in 1985, followed by investments in the power generation project and construction/operation of the sewage‐treatment plant, Marubeni has been conducting wide-ranged businesses in Qatar. Furthermore, to contribute not only in business, but also in Qatar’s society through culture and education, Marubeni signed a memorandum with Qatar University on making donations, in April 2012. With this fund, Marubeni carries out projects in collaboration with Qatar University to contribute to the country’s society. 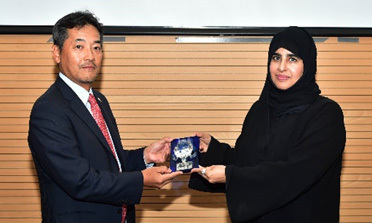 In the education area, Qatar’s first Arabic language encyclopedia on Japan was published to widely promote deeper understanding of Japan mainly among young people in Qatar. The concise encyclopedias were distributed across local elementary, junior and senior high schools by Qatar University. 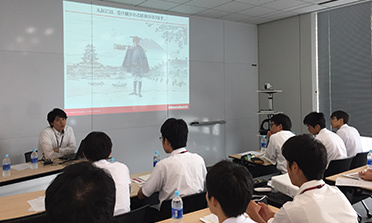 Marubeni offered the university sponsored courses in Japanese, History of East Asia, and Sociology of East Asia. and also introduced “class demonstration,” a Japanese-style math educator training system. Cultural activities include Japan visits and internships at Marubeni Head Office by Qatar University students, a cultural exchange event through Japanese traditional sweets and the tea ceremony at the Qatar University campus, an animation workshop, and the Great East Japan Earthquake panel display. Marubeni will continue these efforts to contribute to the society of Qatar. Toyota Ghana Co., Ltd. is a Toyota car dealer established in 1998 with 100% investment from Marubeni. The company is working to improve customer satisfaction in both sales/marketing and customer service. At the Toyota Africa Agency Conference held in Dubai in 2017, Toyota Ghana won the “Outstanding Customer Service Award,” the top honor in the service sector, for the fifth consecutive time since 2012. By being awarded for five years in a row, the company also received the “Outstanding Customer Service Leadership Award” for the first time in the history of Toyota’s agency in Africa. The company also takes the initiative in community-based CSR activities, focusing on the four areas of education, environment, healthcare, and traffic safety. In particular, education and healthcare are considered priority issues for the whole country, and Toyota Ghana provides medical equipment to hospitals, and educational materials to schools, while also accepting student interns from the University of Ghana. 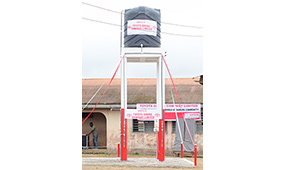 In the environment area, the company has donated wells to local communities in rural areas with no water supply systems, while also promoting tree planting activities. 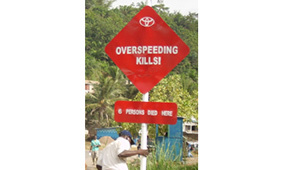 Furthermore, in the traffic safety area which is closely related to the company’s business, Toyota Ghana has made long-term commitments by supporting safe driving through road sign installation. In recognition for these activities, Toyota Ghana ranks high in “The Ghana Club 100 (GC100),” a listing of leading companies selected by the government agency Ghana Investment Promotion Centre (GIPC). On May 18, 2018 T.E.N. 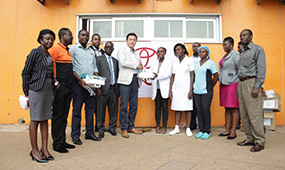 Ghana MV 25 B.V. (MV25), in which Marubeni holds a 25% stake, made a donation of USD 250,000 to Tokyo Medical and Dental University to support the research on infectious diseases at the University of Ghana affiliated Noguchi Memorial Institute for Medical Research (NMIMR) . The donated money will be used for research on dengue fever, Chikungunya, prevention of diarrheal diseases like those caused by rotavirus, as well as for research on applications like antiparasitic compounds derived from medicinal plants. MV25 provides charter services (leasing, operation and maintenance) for one FPSO (Floating Production, Storage & Offloading) system to Tullow Ghana Limited, the operator of the T.E.N (Tweneboa, Enyenra, Ntomme) oil fields in the Deepwater Tano region located about 60 km offshore from the western coast of the Republic of Ghana. This FPSO is named the “FPSO Prof. John Evans Atta Mills” after the former President, and is anchored at a depth of 1,500 m. It has been producing crude oil and natural gas since 2016. 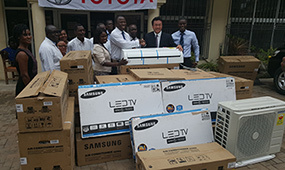 In addition to contributing to industrial development in the country through projects like this, MV25 looks for ways to strengthen the friendly relationship between Japan and Ghana, and make social contributions that will be useful for the development of the nation, resulting in this grant for medical research. Ghana is where Dr. Hideyo Noguchi died from yellow fever while conducting research on that same disease. Since the establishment in 1979, NMIMR, named in honor of Dr. Noguchi, has conducted technical collaboration mainly on basic research and has filled an important role as base of interaction for medical research between Japan and West Africa. Through MV25, Marubeni provides a grant for research at this base, forming a bridge between the medical research in both countries, further strengthening the bonds between Japan and the Republic of Ghana and contributing to the advancement of medical research. Since 2007, Marubeni has been supporting Social Skill Training (SST), a program hosted by the Aftercare Division of the social welfare corporation Osaka Child Welfare Services Association. The SST is a training course which aims to provide children living in foster care with the knowledge needed to be independent members of society after they graduate ; the program anticipates the problems that the children will need to face when they begin living on their own. The program is supported by the Ministry of Health, Labour and Welfare, and targets third year junior high to third year senior high school students living in orphanages. Through specific themes the youths face in everyday life, such as keeping a personal grooming, table manners, the law, and warnings against scams, they aim to acquire social skills. In July 2018, Marubeni Osaka Branch invited 12 junior and senior high school students from orphanages in Osaka. 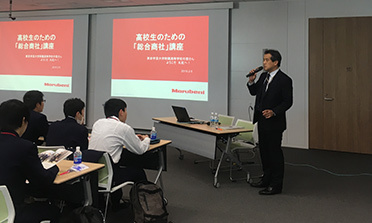 Marubeni employees gave them a presentation about the social role of Marubeni as a general trading company, along with tips on being prepared to become a working professional. As part of our effort to promote career education for developing work attitudes and career views for the youths of the next generation, Marubeni is happy to receive company visits and interns. 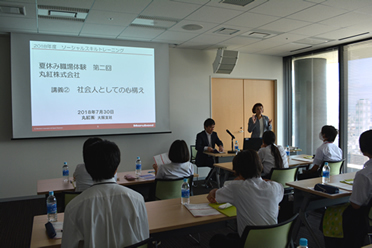 For junior and senior high school students, dedicated seminars on “Sogo Shosha” are offered, and a total of 407 students from 23 schools visited the company in FY2017. At the seminar, the business of sogo shosha is introduced in a an easy-to-understand style, along with explanations on Marubeni’s efforts on the environment and other increasingly serious issues in the society. The students also have a chance to talk with Marubeni Group employees who are their school alumni. A wide spectrum of people ranging from junior staff to veteran executives directly share their experiences and advice, thus offering an opportunity for the students to feel a connection to Marubeni.